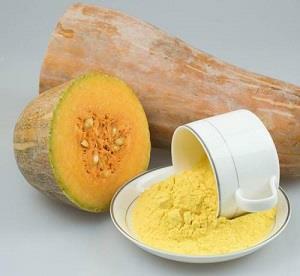 Pumpkin is a cucurbitaceous herbal plant, which has the functions of tonifying qi, moistening lung and resolving phlegm. Recent studies have shown that pumpkin is rich in pectin and trace element cobalt. Pectin can delay the absorption of sugar and lipid in intestinal tract. Trace element cobalt is the essential trace element for insulin synthesis by islet cells. Therefore, regular consumption of pumpkin can help prevent and treat diabetes. However, pumpkin contains a certain amount of cobalt. Sugar, too much food can also cause increased blood sugar. So, how do diabetics eat pumpkin? Choose mature pumpkin, rinse, peel and seed, cut into thin filaments; soak it in clear water for one hour and then take it out. Dry it; bake it in oven (60 to 80 degrees Celsius for eight hours), or fry it in an iron pan; grind the crisp pumpkin filaments and store them in a sealed container for later use. The average patient can take one or two tablespoons (30 to 40 grams) of pumpkin powder at a time and take it after mixing in warm boiling water, three times a day for fifteen days, and then increase or decrease the dosage of pumpkin powder according to the decrease of blood sugar.